Diwali, the Hindu festival of lights, is celebrated every autumn in the northern hemisphere and every spring in the southern hemisphere. It usually falls between mid-October and mid-November. Celebrations may involve family feasts, colorful decorations in homes and temples, and prominent displays of light. Making or buying festive illuminations and decorations for your house is a great way to decorate your home for Diwali. Clean your home thoroughly before you decorate. Dust, sweep, do the laundry, clean all the rooms. It's customary to thoroughly clean your home to help welcome the Goddess Lakshmi, the Goddess of wealth and fortune, during the celebrations. Diwali also marks the start of the new year, so getting rid of old clutter and negativity feels like a fresh start for many. 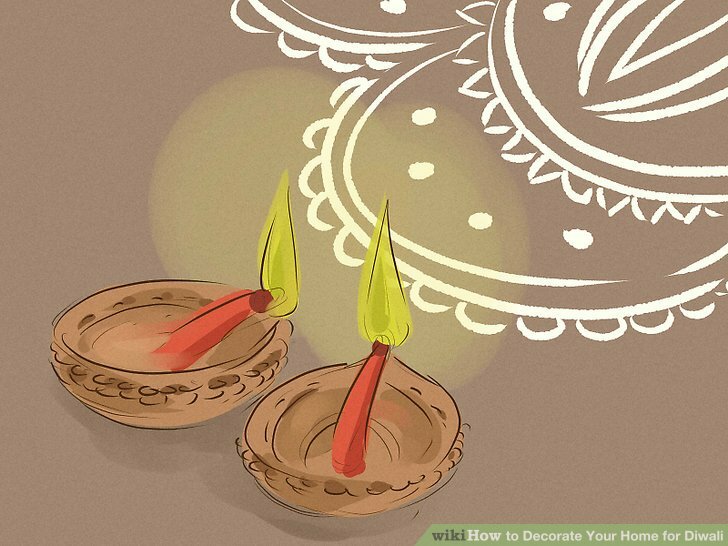 Many Hindus and even non-Hindus also wait for Diwali to redecorate and paint their walls. To add some extra style without painting the whole house, you might sponge paint your room or just a single wall. Usually, the guests and relatives are seated in the living room during celebrations. So you can take a little extra care to decorate your living room. Don't worry if your living room is not very big or fancy; having a clean, aromatic and well-lit room does the trick. 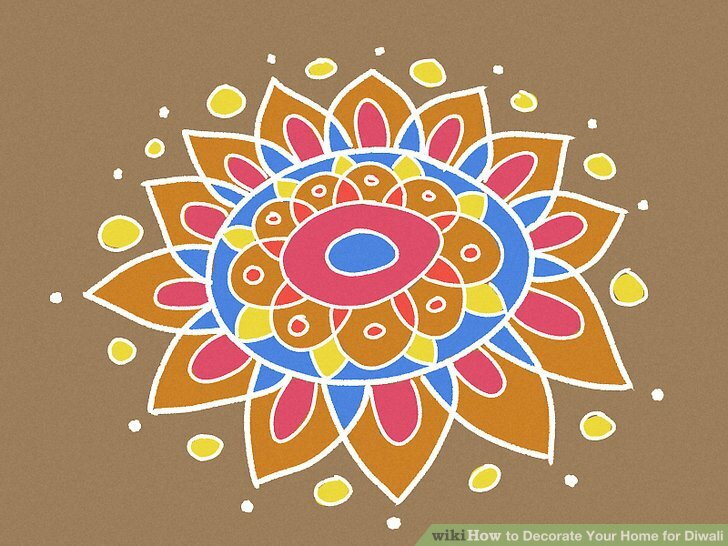 Use colored rice, sand, or painted materials to create rangoli. Rangoli, traditional art designs made on the floor during Diwali and other Hindu festivals, are traditionally made of colored granular substances, such as rice or sand. You can buy stencils to make rangoli on your own floor easily, or you can use chalk to draw the design for your own rangoli on the floor. Then use a funnel with a small opening to slowly pour the rice or sand on top of the design. You can usually buy colored rice or sand at arts and crafts stores. However, you can also create your own colored rice by mixing of rice, of vinegar, and 10 drops of food coloring in a container, covering the container, and shaking the ingredients together for 2 minutes. Make any pattern of your choice like flowers, the Goddess Lakshmi, a Mandala, etc. If you’re on a budget or simply don’t want to deal with the hassle, simply paint elaborate designs on cardboard or pieces of wood and lay these on the floor as your rangoli. Make your wooden rangoli more elaborate by placing stones, mirrors, or beads on top of them to enhance the painted designs. The general purpose of rangoli is to add decoration to your home and to bring good luck for your family. In some parts of South Asia, unmarried young women draw rangoli during the month of Margazhi to welcome the god Thirumal into their home and to hopefully find a husband in the near future. Hang a colorful toran from your door. Buy and hang up prefabricated toran/bandankar or make your own out of greeting cards, craft paper, glitter, and beads. To keep with tradition, add marigolds or mango leaves to your toran and hang it across the outside of your front door for an auspicious and colorful piece of decor. Most toran have flowers or leaves on them. However, if you don’t have any fresh flowers, you can also fold paper flowers or [[Fold a Paper Leaf|leaves out of decorative paper, or simply cut pieces of cardboard or craft paper into flower shapes and hang these from the toran. Beyond simple decoration, toran also serve a religious purpose: they’re used to attract and welcome Lakshmi, the goddess of wealth, into your home. Put up Tanjore paintings to brighten your prayer room. Many people take time during Diwali to add decorations to the prayer room in their house and make it exceptionally clean. To enhance your prayer room’s aesthetic, hang vividly colored Tanjore paintings in it and illuminate them with soft lighting. 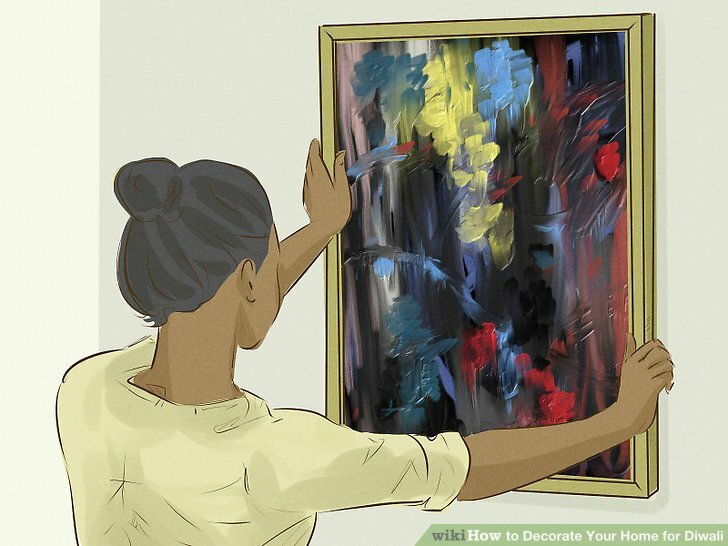 For a more decorative look, hang paintings that also contain gold, glass beads, or precious gems. Tanjore paintings are generally used as devotional icons. 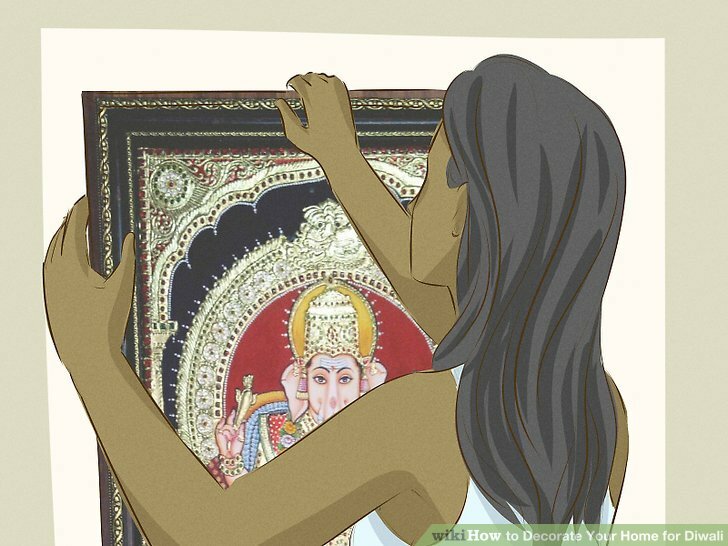 If you’re hanging paintings, especially for Diwali, they should ideally be compositions of Hindu gods, goddesses, or saints. Decorate your walls with colorful paintings, murals, and designs. You don’t need to limit your wall decorations to your prayer room. If you have more paintings and murals, hang them on every wall in your house to make every room brighter and more colorful. If you don’t have any paintings or murals, consider making your own wall decor out of old CDs, newspapers, greeting cards, craft paper, or just pieces of cloth. Painting traditional motifs and designs on your walls is a great way to add vibrancy and color to your walls, as long as you’re willing to paint over them later! 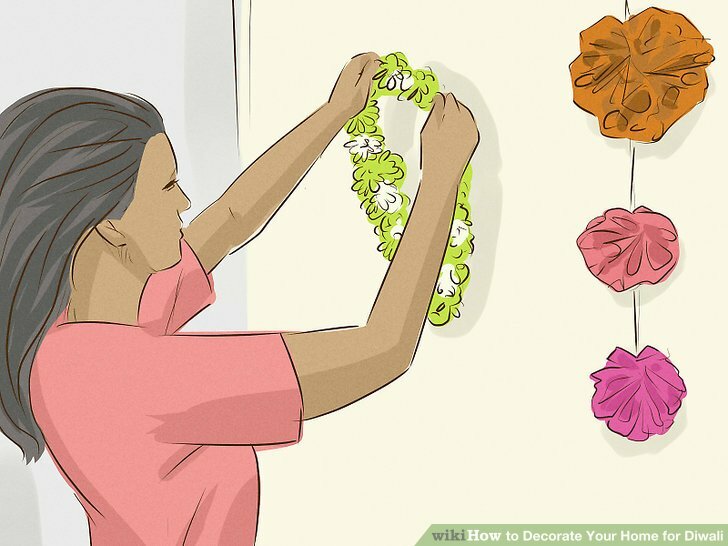 Add color to your home by hanging garlands of flowers or pompoms. String together colorful bunches of flowers, pompoms, crepe paper art or any other vibrant and lightweight pieces of decor. 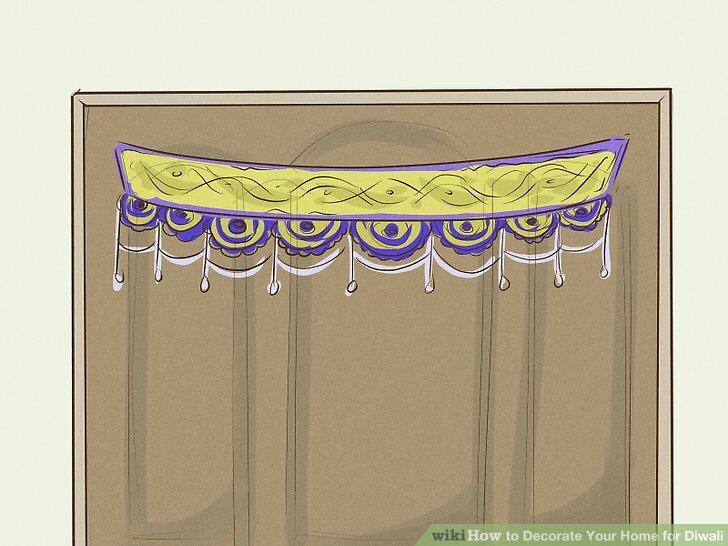 Then, d**** these garlands from the ceilings and across your household items to add a final bit of color to your home. Any species of flower will do for your garlands, so long as they’re colorful! Get creative and make paper ring decorations and make shapes and patterns on the walls. These are cheap and easy to customize for your decor. There are some species of flower that are believed to be preferred by certain Hindu gods. For example, Kali prefers red hibiscus, Lakshmi’s favorite flower is lotus, Lord Ganesha enjoys marigold, and jasmine is Lord Hanuman’s favorite flower. The lotus is a symbol of spiritual liberation and knowledge. The Goddess Lakshmi carries it in her hand.. Make your home more inviting to the Goddess Lakshmi by making lovely paper lotus flowers and placing them near the light display so she sees them clearly. Make plain candles festive with pressed flowers. 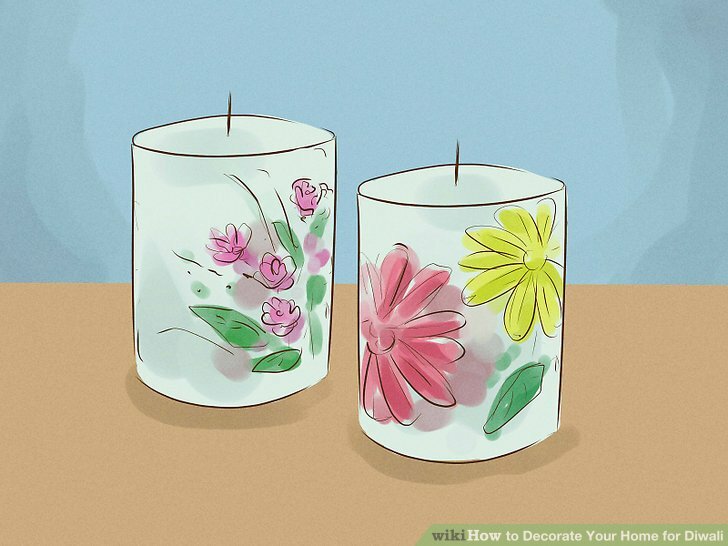 Embed flowers in a plain white candle by placing a small amount of glue on them and pressing them flat against the candle. Then, heat some clear wax in a double boiler to , dip the candle in the wax for 30 seconds, then dip it into cold water and dry. You should be able to achieve your desired thickness with 1 dip in the wax. However, you can repeat the process of dipping the candle in the hot wax and then dipping it in the cold water until you achieve the preferred amount of thickness. Make sure you dip the candle in and out of the wax in a smooth motion to avoid making it lumpy. The water you use doesn’t have to be ice cold; it just needs to be colder than room temperature. You can use flowers of any shape, size, or species to press into your candles, so long as they’re colorful! If you’d like your candles to have more religious significance, some examples of flowers preferred by Hindu gods include red hibiscus, lotus, marigold, and jasmine. Make this activity fun for kids by having them fingerprint a design on your candles. Draw henna designs onto plain white candles. Use henna paste and a henna tattoo cone to create beautiful, auspicious designs on your candles. Leave the henna designs to dry for at least 1 hour or overnight for best results. Your designs can be anything you wish. Traditional henna motifs include flowers, stars, water drops, spirals, and leaves, but feel free to make your own design as well! Decorate with diyas. Diya oil lamps are a very common decoration during Diwali, used throughout the Indian subcontinent. You can easily buy cheap earthen diyas. Alternatively, you can try using fruit or seashells for easy homemade diyas, as long as they're sturdy. To make your own unique and original diyas, carve out the inside of a piece of fruit and place a candle inside it, or simply put a candle in a large seashell with a flat bottom. For best results, use a fruit with a rind that is easy to keep together and manipulate, like an orange or an apple. You can also use prefabricated diyas made of more traditional materials, such as clay or brass. These can be bought at most South Asian grocery stores. Try making oil lamps at home. You can make them colourful and use the scented oil of your choice. Diyas are very significant in Hinduism; they symbolize knowledge, enlightenment, and one’s submission to a higher power. If you have a special design in mind or are keen to make unique diyas of your own, you can create beautiful patterns on plain diyas with colours, flower, or stones. Create interesting light displays with lampshades and lace candles. 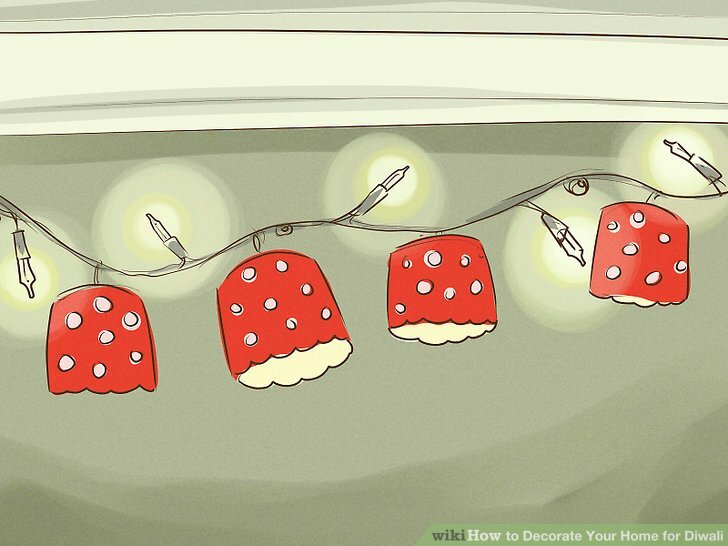 You can use traditional string lights that suit your decor, or make your own lampshades. 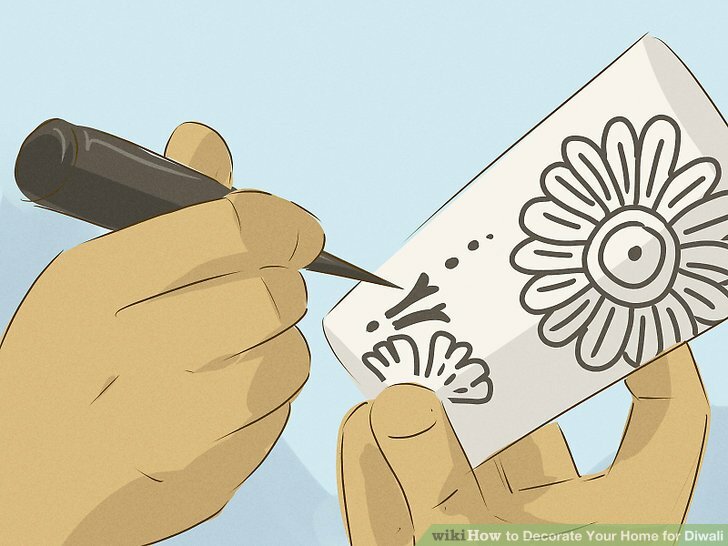 Draw floral patterns, stars, or other designs on the sides of a small cardboard box and cut them out. Then, place the box over a lightbulb to create festive displays of light. Alternatively, wrap lace around a mason jar and place a candle inside to produce a similar effect. Experiment with different colors and designs of lace to see which best create the atmosphere you’re trying to bring about in your home. For Diwali, colorful lace works best! 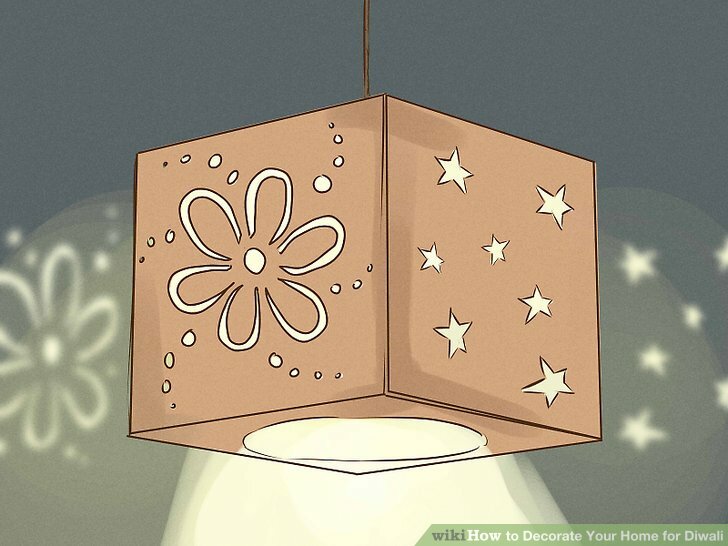 If you have access to a colorful cardboard box, use that instead of a plain box to make your lampshade more festive. If you’d rather not make your own lampshade, there are plenty of prefabricated lampshades with cutouts available online or in home decor stores. 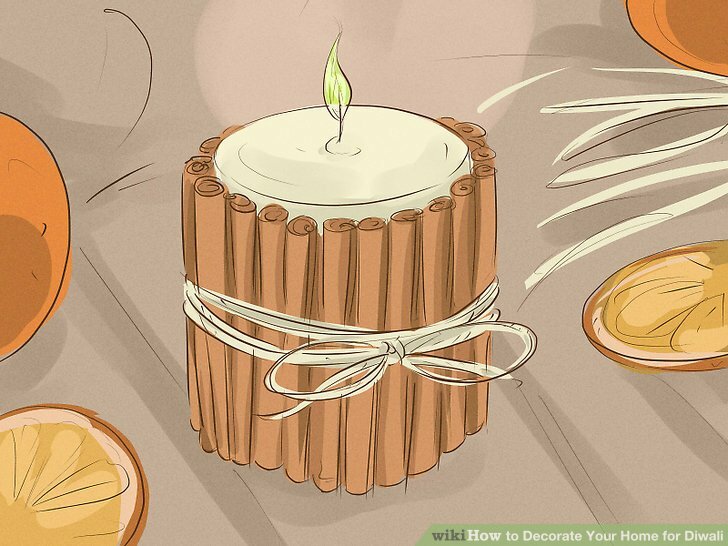 Wrap cinnamon sticks around your candles to spice up your home. Tie a number of cinnamon sticks around a mason jar or glass. 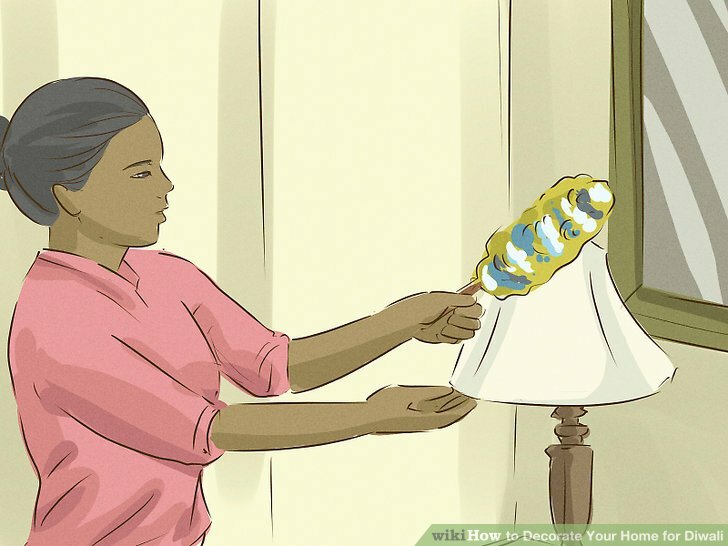 Then, place a candle inside the glass and light it. Cinnamon candles not only add a woody theme to your home, but the heat from the candle will also cause the cinnamon sticks to release their fragrance and fill the area with the smell of cinnamon. If your candle is relatively thick, simply place your cinnamon sticks directly against it and wrap them together with a rubber band. Colorful paper cups and doilies can be purchased at any crafting store. You might also be able to find seashells in crafting stores, although you can also just find them along the seashore. 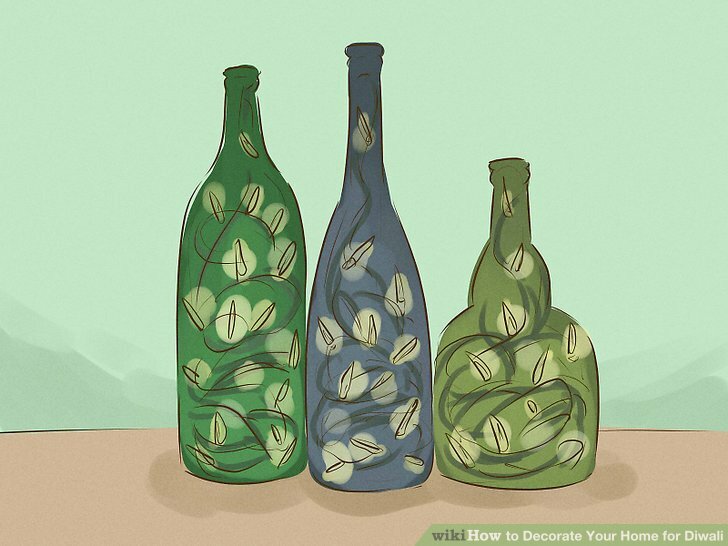 Place lights inside colored glass bottles or jars to make lanterns. Find any empty glass bottles or jars that are lying around your house, especially ones that are colored, and make sure their interiors are clean. Then, place candles or light bulbs on the inside to make beautiful colored lanterns. If you have empty bottles or jars that aren’t colored, simply cover them with bright cellophane paper to give them some color. You can also create designs in the paper for added effect. You can make Mason jar candles and scented candles to fill your home with delightful fragrances. For the best aesthetic appearance, use Mason jars and glass bottles with unique or elaborate shapes to them. You can buy white candles or reuse old candles and add a coat of glitter to them using glue. This will make them more special for Diwali.